A Fun Way to Spend the Day, and Learn Something Too! Fore! 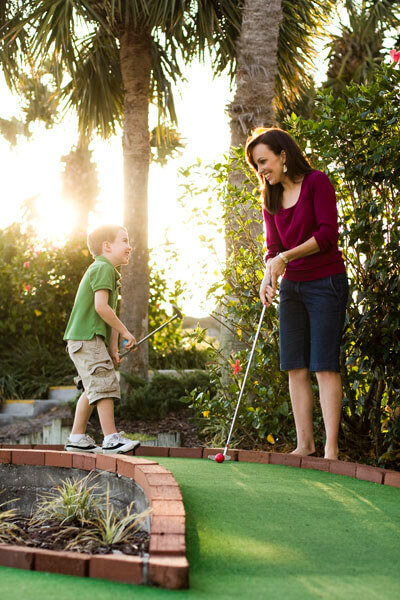 Adventure golf is one of our many attractions at Family Fun Center of Lakeland that our guests absolutely love! Our minigolf course, known as Adventure Golf, is fun from age eight to eighty but is also educational! Yes, we said educational! The game combines math, problem solving, decision making, and other skills to play! Who knew! Come experience the fun, AND educational benefits of mini golf with us! Math Skills– By playing a simple, and fun game of miniature golf, your child will learn several mathematics skills such as geometry, quantitative and abstract reasoning, and math modeling! Who knew! Problem Solving Skills– Your child will learn to identify the problem (that the ball is not in the hole, and needs to be) and utilize his or her brain to figure out the best way to solve that problem. If your child does not make the shot the first time, he or she will learn how to adjust their strategy to perfect their initial course of action. Decision Making Skills– Your child will also have to decide which is the best course of action for the ball. How much force should they use when hitting the ball the first time? How about the second? Attention to detail is something your child must learn in the game. They must focus on the ball long enough to plan, execute, and make the shot, which takes precision! If you told your child that they must finish their homework before you visit us, you may need to rethink that! They might just learn something while playing minigolf!